Due to carrying convenience, most knife users prefer folders to fixed blades. Even so, I’ve always liked the straightforward nature of a fixed-blade design. Withdrawn from sheath containment, a fixed-blade knife stands at the ready. While there are a few rather stubby fixed-blade designs that can be belt-carried without a lot of trouble, most have limitations as game care tools. They might work well as a skinner, but the abbreviated blade length makes the design less than adequate for general field dressing and boning. Enter the fixed-blade “Hunter’s Companion” from Idaho Knife Works. This keen cutter features a 3-1/2-inch blade crafted from 1075 high carbon steel, with a Rockwell hardness of Rc 56-57. Furthermore, the blade has been differentially hardened, with the back of the blade and tang less hard than the cutting edge. This provides a measure of blade flexibility without the accompanying brittleness. The full-length blade tang is enclosed with a pair of hand-filling hardwood scales. Since each knife is custom made to order, a wide selection of handle material is available, including domestic and exotic hardwoods, mammoth ivory, elk antler, buffalo horn, and bone. The handle scales are attached to the tang with brass pins, but mosaic pins are available as an option. A top grade, tight-fitting leather sheath is provided with each knife. Rather than stitching, brass rivets are used in sheath construction. When positioned on the belt, the sheath-contained knife rides just a few inches below the waistline. And there’s no impairment of movement when moving into a seated position. 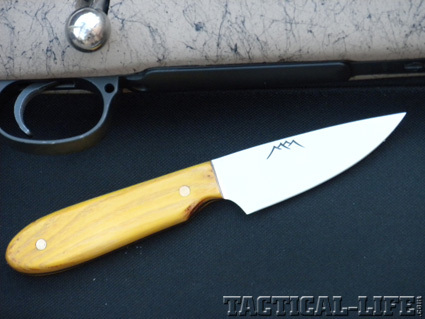 The Hunter’s Companion is handcrafted by Mike Mann of Idaho Knife Works. Mike grew up in rural Illinois hunting and fishing with his brothers on the family farm. And he made his first knife in a high school shop class during the mid-1960s. Mike met his wife Debbie in the late 1970s and after marriage they made their home on a piece of remote property in northern Idaho. Family and friends helped the newlyweds erect a log cabin on their property. And from this humble beginning, Mike’s knife-making passion grew from a hobby to a full-time business.